Sally looks like a real toddler and is the perfect best friend to cuddle and play with. 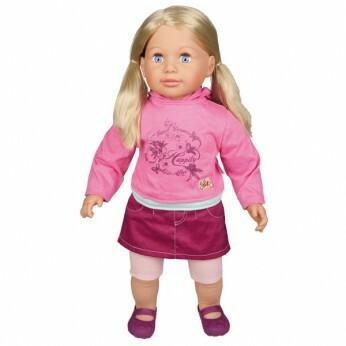 She is soft bodied and 63cm tall!She comes with shoulder length high quality blond hair that allows continuous hair role plays. Colours and Styles may vary…. This toy costs approximately £19.99 (for the latest and best prices make sure you check our retailer list for the Sally Toddler Doll above). In our review of Sally Toddler Doll we classed it as being suitable for ages 1 to 3 years but recommend you check the manufacturer specific advice before purchasing.